TME has introduced a new series of Keysight digital multimeters to its offer. 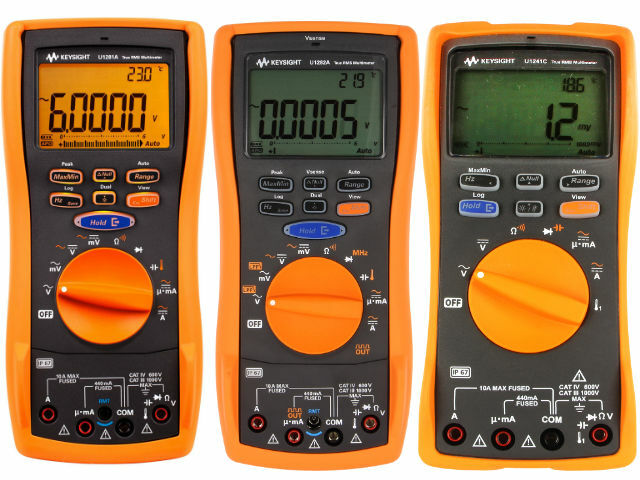 The U1241C and U1242C models are equipped with a 4.5 digit LCD display, whereas the U1281A and U1282A are equipped with a 5 digit LCD display. Both series of meters are designed to operate in harsh industrial and environmental conditions. They are resistant to falls from a height of up to 3m, they meet the requirements of IP67 tightness class, and they have a wide operating temperature range from -20°C to +55°C. The U1241C and U1242C meters are specially designed for technicians and industrial engineers dealing with maintenance. The U1281A and U1282A models can be used for precise measurements and fault detection in electronic systems. All above mentioned models of digital meters can communicate with PCs. Free Meter Logger software provides a convenient and useful data logging function (the choice of sampling interval, setting threshold values). Measurement data can be presented and reported in a number of ways. Thanks to this fact, it is easier to interpret recorded data and detect faults. enhanced battery life: up to 400 hours. enhanced battery life: up to 800 hours.